When Bus (Columbus) last checked in (White Water Epoxy) he had just gotten back from the Rogue River where he used a Carlson pump made with KEMKO glue. Now he and John are working on a test pave in South Korea in preparation for the paving of two bridges! ChemCo products can be split loosely into two main categories: one being concrete repair and protection products (although applications range beyond the realm of concrete as demonstrated by Carlson and by many others), and the second being the epoxy asphalt driving surface that the guys are helping put in place in South Korea. Three months ago, we mixed and drummed 274 metric tons of paving materials and prepared specialty equipment for the trip to South Korea. The material and equipment, including a smorgasbord of spare parts, were loaded into 20 shipping containers, put onto trucks routed to the Port of Oakland, then shipped across the ocean to Busan where they are currently in customs. The travelers are the experts who will ensure that the tack coat and two-part, epoxy asphalt system are properly applied and the machines properly operated. Once the test pave is finished, Bus and John will return home before returning to South Korea, with Ralph this time! The three will arrive in Seoul, then take high speed rail across the county to the East Coast where they will first work on the Ulsan Harbor Bridge. 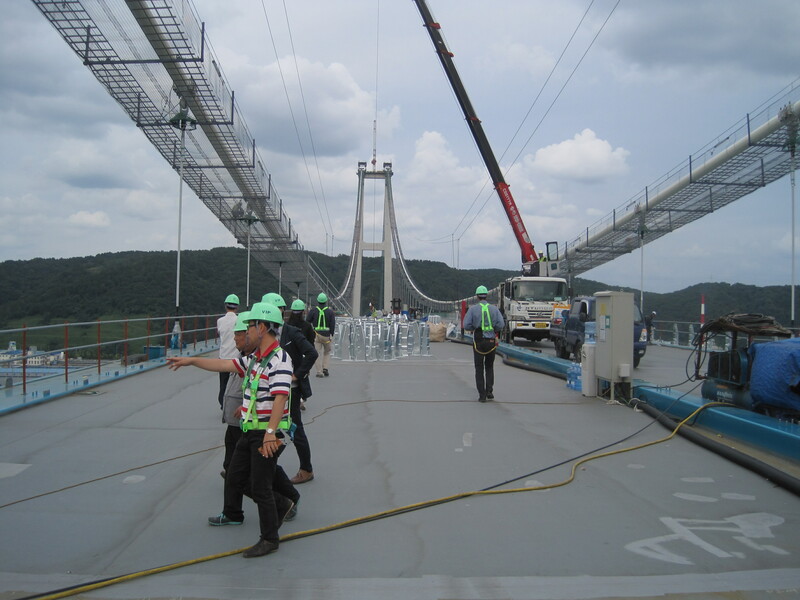 Next, they will return to the West coast where they will be overseeing the paving of the Dan-deung Grand Bridge. The Ulsan Bridge, at 1,490, meters is one of the largest single span suspension bridges in the world. And the Dan-deung Grand Bridge is described as “The world[‘s]-longest, as well as the first single tower suspension bridge in South Korea representing great harmony with the beautiful scenery of Gogunsan Islands.” These two bridges will join the esteemed ranks of ChemCo-paved bridges like the Golden Gate Bridge, the Bay Bridge, the San Mateo Bridge and the Coronado Bridge here in California as well as many other bridges around the world in countries such as Vietnam, Canada and Thailand. Let’s all wish Bus, Ralph and John safe travels!